Peppers Market & Sandwich Shop owners Jess and Missy Fowler are committed to finessing distinctive, quality ingredients to keep loyal clientele coming back time and again. Scratch-made food never tasted so good. Perhaps it’s the roasted-in-house meats, the fresh, flavorsome toppings or the artisan bread. Whatever the case, Peppers is a cut above other sandwich shops of similar ilk. The best choice on the menu? Without question, it’s the “Trippin’ Chicken,” a delectable concoction crafted by a Peppers customer during an in-store custom sandwich competition. The hot-served creation features grilled chicken and marinated portabella mushrooms with fresh basil pesto and lightly roasted garlic sauces, topped off with sundried tomatoes, avocado, roasted red peppers, spinach, goat and Swiss cheeses. 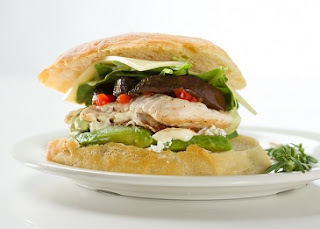 Other standout hot sandwiches include the mango mahi mahi; pork loin (seasoned with garlic, thyme and red pepper and topped with chunky apple spread and a specialty house sauce); and a vegetarian black bean burger on a ciabatta roll. When it comes to cold sandwiches, you can’t go wrong with the aptly named “The Club (with a twist),” a two-hands-required offering with roasted lean turkey and ham stacked on a ciabatta roll with bacon, avocado, lettuce, tomato and roasted garlic sauce. Then there’s the turkey reuben with sweet jalapeño coleslaw, Swiss cheese and dressing. Fresh salads are also available. Or, if you’re in the mood for soup, Peppers offers several choices daily such as slow-simmered Texas-style chili, turkey tetrazzini Florentine and roasted tomato and herb. A “Grab and Go” section at the restaurant’s counter showcases tuna and chicken salad, fruit and pasta salads as well as black bean hummus, white bean dip and fresh baked goods. Most items are packaged in quart-sized containers. Breakfast attractions range from California omelets and flatbread sausage and egg sandwiches to fruit muffins and yogurt with granola. Sunday brunch ups the ante with additional temptations like eggs Benedict Florentine and stuffed French toast. The dining space at Peppers boasts a modern, airy atmosphere with an upscale fast-casual feel. Make no mistake: Peppers is one of Morrisville’s best dining destinations.